In today’s increasingly urbanized society, many individuals aren’t exposed to the meaningful work of simple gardening, farming, raising animals, or other agri-business activities. In fact, a substantial portion of young Americans are not being “handed down” the traditions of an agriculture based economy, which are vital to our economy. The New Ag School (NAS) is working to change that in Loudoun County. NAS is an innovative hands-on program dedicated to raising up leaders who understand, appreciate and can do the work needed to support agribusiness today and into the future here. NAS provides exposure to authentic farm industry, as well as an introduction of what it takes to run a business – whether a winery, bed and breakfast, or farm. A mentor farmer employs and trains our future agribusiness leaders. Working side-by-side with their mentor, mentees come away with a greater appreciation for all that farmers and rural business owners accomplish for themselves, their businesses, and the larger community. With dedicated first-hand training and insight, mentees acquire a wealth of knowledge and an invaluable skill set that can be applied to many different agricultural settings. Through NAS, they truly have the opportunity to be the future agribusiness leaders of Loudoun County. The New Ag School(NASA) seeks to develop a workforce that can meet the needs of the shared economy of Loudoun County. Specifically, NAS Focuses on agribusiness education particularly in the areas of farming, value added process and hospitality. NAS is dedicated to training individuals to be equipped, skilled and passionate about working the land and relating with consumers as a career. We are also committed to the continuous training of our trainers. Program participants become competent stewards who embody the culture of sustainability through their experience in the learning program. Fletcher Henderson has a depth of experience in the world of wine; from conducting education classes, tastings to vineyard, and winemaking experience. Fletcher volunteered in several Virginia vineyards from the mid-1990s before becoming an assistant winemaker for many northern Virginia wineries in the early 2000s. With a knack for vending, Fletcher spent the majority of the past decade working as an executive sales representative and wines broker for over thirty Spanish wineries and importers. Fletcher’s experience in the wine industry reaches beyond borders, as well. As an independent broker and Estates specialist, Fletcher’s worked has reached Spain, Hungary, Chile, and Argentina. Kellie Hinkle serves as the agricultural development officer and interim assistant director for Loudoun Economic Development. She manages the team responsible for promoting the sustainable economic growth and vitality of Loudoun’s rural economy. Her professional career includes 10 years of state and local experience in implementation and development of new and existing businesses and promotional programs assisting specialty food producers and agribusiness groups. Hinkle works with the Loudoun Winery Association, Blue Ridge Cattleman’s Association, Loudoun Christmas Tree Growers, Loudoun Sheep Producers and the newly organized Loudoun Equine Alliance. She is managing the implementation of Loudoun’s rural economy business development strategy and organizes the annual Forum for Rural Innovation. Beth was born in Mexico City and grew up in Hidalgo State. She holds a B.S degree in Agronomy with a minor in Horticulture from the Universidad Autonoma Agraria Antonio Narro-Torreon Coahuila, Mexico. After graduating, Beth pursued her Master’s Degree in Nutrition and Postharvest Physiology at the Food and Development Research Center (CIAD) in Hermosillo, Son. Mexico. Her work experience includes horticulture research and extension. Beth joined the VCE-Loudoun County Office in 2013 and she continues supporting research and providing extension advice and bilingual training for farmers, beginner farmers, and agricultural workers on every area of horticulture in Loudoun. 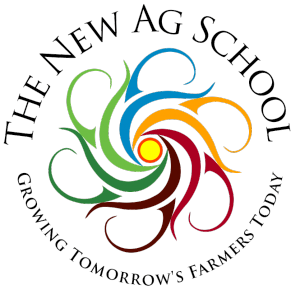 The NewAgSchool is a non-profit 501c(3) corporation. Please make a donation to support us today!